This article was originally published in The Mycologist, 1989, 3(4), 171-173 and has been republished here with permission from the Editor. Cotton is still the worlds leading textile fibre and some 15 million tons of cotton fibre are grown annually by about 80 producing countries. Waste, generated from the mechanical processing of raw cotton prior to spinning, provides an ideal substrate for the growth of some edible mushrooms notably Volvariella volvacea the Chinese or straw mushroom and the oyster mushrooms (Pleurotus spp). About 7% of lint (i.e. fibre) waste is produced in spinning. However, this primary waste is quite valuable and can be re-used in various ways but the residual or secondary wastes have little value and are therefore attractive for the purpose of growing mushrooms. S T Chang, of the Chinese University of Hong Kong, pioneered the development of cotton waste as a substrate for the indoor cultivation of V. volvacea. Traditionally this species has been grown outdoors on rice straw in several S.E. Asian countries and the reported mushroom yields have varied between 1.5% to 14.7% biological efficiency (B.E.) which is defined as the ratio of fresh weight of mushrooms to dry weight of compost at spawning expressed as a percentage. In 1971 cotton wastes were first introduced in Hong Kong to serve as a kind of 'heating material' to raise the temperature of mixed beds of cotton waste and rice straw so that mushrooms could be produced indoors during the winter months. In the event the average mushroom yields from the cotton-straw beds were much higher than the yields of straw-only beds and by 1973 cotton waste had completely replaced rice straw for indoor cultivation. In Hong Kong it had the advantage of being much cheaper and more readily available than rice straw as well as giving a higher and more stable yield of mushrooms (generally 30-40% B.E.) and earlier development (pinheads appearing 5 days after spawning and the first harvest 3-5 days later) than that obtained on straw under the same conditions. Taiwan mushroom growers prefer to use a 2:1 mixture of rice straw and cotton waste as substrate, presumably because of the greater availability of rice straw in Taiwan. The basic procedures for cultivating V. volvacea on cotton waste compost are described as follows. The cotton waste is usually mixed with 4-5% rice or wheatbran and about 2-6% limestone (or calcium carbonate). It is important to partially compost the mixture and this process, following the addition of water, is carried out in a wooden frame for about six days with mixing at 2 day intervals. The compost is then made up into beds and pasteurized by introducing steam into the mushroom house. An air temperature of 60-62°C is maintained for 2-3 hrs and the mushroom house is then cooled down to 52°C by the introduction of fresh air. This temperature is maintained for up to eight hours with a continued stream of fresh air. The steam valves are then closed and the air temperature allowed to drop gradually to 34-36°C for spawning. This latter step takes about 12-16 hrs depending on the outdoor temperature. The temperature of the room is maintained at 32-34°C during the period of spawn running. 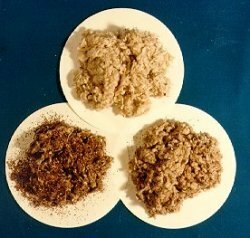 The preferred spawn substrate in Hong Kong is a mixture of used tea-leaves, collected from local restaurants, and cotton waste in a 1:1 ratio supplemented with 2% calcium carbonate and 2% rice bran. Spawn produced on this medium has the advantage of being less prone to contamination than grain spawn. Small pieces of spawn are inserted into the compost and the beds are then covered with thin plastic sheeting to maintain a high humidity. Under good composting and pasteurization conditions, unidentified species of Actinomycetes and Humicola develop in and on the beds together with mycelium of V. volvacea during the spawn running period. There is convincing evidence that this microflora can stimulate the growth of V. volvacea and at the same time prevent the growth of harmful fungi. Growth of mycelium of V. volvacea is complete in about four days after which the plastic sheets are removed and water is sprinkled on the bed surface; this prevents further growth of Actinomycetes and Humicola and stimulates fructification. After watering the air temperature is kept at 28-32°C. Light is also introduced into the room at this stage by means of fluorescent lamps. It usually takes a further five days for fruit bodies to develop to the stage of harvesting. Straw mushrooms are not usually left to grow to their maximum size but are picked at the stages before the volva enclosing the cap breaks or just after rupture. The former is referred to as the 'button stage' and the latter the 'egg stage'. The first flush lasts for about four to five days and is followed by a second flush about a week later. 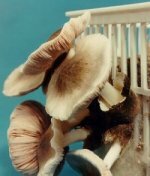 However, the yield of the second flush is only about 10% of that of the first one and most mushroom growers harvest only the first flush. Straw mushrooms are highly perishable and must be marketed within 1-2 days. They tend to liquefy when refrigerated but have a shelf life of about 3 days when stored at room temperature. Mushrooms for export are normally canned. Hong Kong is not self sufficient in straw mushrooms; the major exporting countries are mainland China, Taiwan and Thailand. Canned straw mushrooms can be bought from Chinese supermarkets in the UK. Oyster mushrooms have become increasingly popular in recent years and are now cultivated in many subtropical and temperate countries. Commercial cultivation is usually carried out on straw but the non-composted cotton waste supplemented with rice bran and calcium carbonate used in Singapore also proved an effective substrate. At BTTG (Manchester, UK) biological efficiencies of over 100% have been achieved with Pleurotus pulmonarius grown under laboratory conditions on cotton waste supplemented with 5% wheatbran.